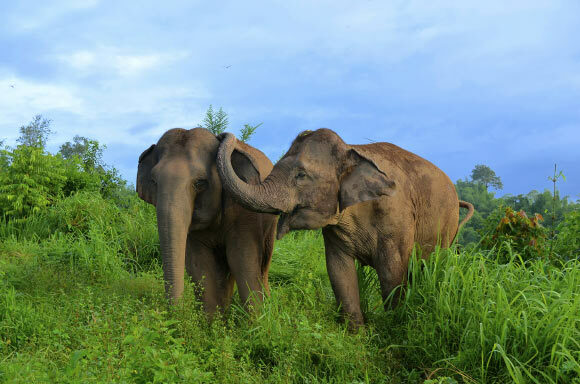 Evidence continues to build for Elephant intelligence: In 2011 Elephants in a study at the Thai Elephant Conservation Center demonstrated their ability to cooperate and developed “shortcuts” to obtain food rewards that the researchers hadn’t even considered . Skip ahead a few years to 2013 when National Geographic reported on the research of Joyce Poole and Petter Granli who have “decoded” the body language used by elephants for detailed communications. They also comprehend the gesture of pointing and its significance; a rare cognitive feat. Now research has tapped into elephants’ emotional intelligence. According to a study lead by Dr. Joshua Plotnik, elephants seem “console” their fellow in distress. Comforting individuals make unique “chirping” vocalizations and will touch the distressed pachyderm on the face or put his/her trunk in the animal’s mouth. Image credit: E. Gilchrist / the Golden Triangle Asian Elephant Foundation.